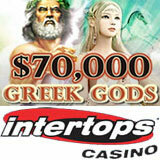 Intertops Casino players will be climbing Mount Olympus this month to claim their place with the Gods – and win a share of the $70,000 in casino bonus money and cash prizes to be awarded in May. Buy! Sell! Spin! Intertops Casino customers can now enjoy Bulls and Bears, a new stock market-themed slot game where wild Bull and Bear symbols double the prize and quadruple winnings when they appear together in a winning combination. The Feature Guarantee system ensures that the bonus game is triggered regularly and loads of free spins give a great return on investment. As always, Intertops players will earn points as they play this month. So that everyone has a chance to win in the Greek Gods giveaway, players are ranked in six levels according to the amount they play. For May the levels are named after Greek gods: Hercules, Hermes, Athena, Aphrodite, Poseidon and Zeus. Players that reach the top “Zeus” level can win $1000 cash prizes. There are huge bonus prizes awarded in the other levels too. Players can check their current points and ranking any time on the Greek Gods scoreboard. The Greek Gods will smile on many more players throughout the month as hundreds (advised by email) will receive additional free bonuses up to $250. Intertops Casino offers more than 300 casino games including million dollar slots jackpots like Jackpot Pinatas and Aztec’s Millions. Intertops has been one of the world’s favorite online casinos, sportsbooks and poker rooms longer than any other online gambling company. Its 24-7 toll free phone and live chat player support shows the company’s ongoing commitment to customer service.